This article has new content coming soon from stub and may not be complete, confirmed, or correct. Please update it as soon as any relevant and accurate material is available. Editors must cite sources for all contributions to this article. Edits that do not follow this standard will be reverted without notice. For more information, see the Citation Policy. Xaras, Greed of Xivu Arath is a Chimera that serves Xivu Arath, and is the boss of the Broken Courier Quest activity. 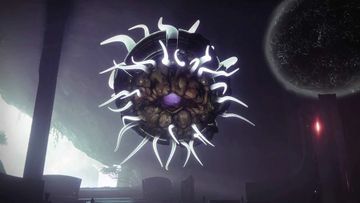 The Taken attempts to stop The Guardian from collecting all of the stolen Awoken artifacts, but is eventually killed in the process. Xaras is the third known Chimera after the Voice of Riven and Inomina, Plague of the Well. Xaras also proves that Chimera are born from pure darkness and are not spawn from only Riven, or Taken Ahamkara for that matter.